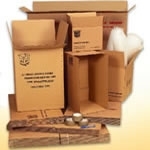 The removal boxes are ideal for 3/4 Bedroom house removals. The packing boxes in the supersized pack include our Jumbo Tea Chest Heavy Duty Double Wall packing boxes. This is the largest packing box we supply, comes with hand holes each end for easy lifting. This jumbo tea chests box heavy duty double wall is good for blankets, continental quilts, pillows, cushions, carver chairs, cabinets, tables, toys, camping equipment, etc.